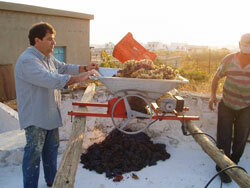 In contrast to the other islands of the Cyclades, Naxos is privileged with fertile cultivatable land. Naxos’ western lowlands represent 30% of its total geographical area. 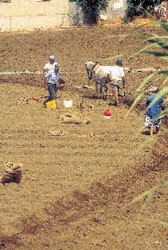 Characteristic of the central zone are low mountains, which enfold basins (valleys), suitable for cultivation. The landscape changes in the eastern and northern-northeastern mountainous zone, characterized by steep pitches (ascending slopes). The land here is dominated by grapevine cultivations. Farmers or this area, were forced to conjure up ways so that they could take advantage of every last bit of land and every last drop of water possible. As a result, they turned agriculture into an art form. Hundreds of kilometers of intricate stonework (supporting terraces made of stone) lace the mountains and hills of Naxos, “braking” the pitch of the slopes into series of enormous steps (terraces). As a result, these steep hillsides are turned into cultivatable land. These stone structures bind and retain the earth, thus multiplying the planting area, while simultaneously better retaining rainwater and keeping its forceful flow in check. This wise though at the same time fragile system, is very characteristic of the Cycladic landscape. During recent years the younger generations, knowledgeable and educated on the matter, are bending over the land and cultivating it anew.